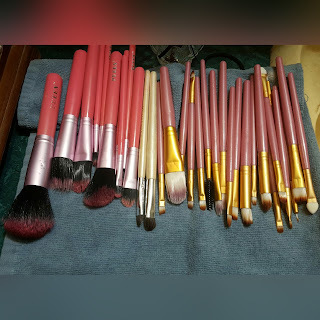 Lulu's Life: How I clean my makeup brushes! 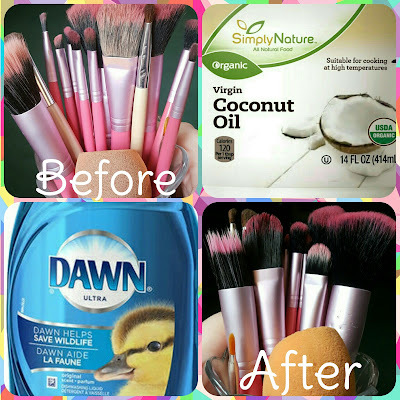 My favorite way to clean my makeup brushes has got to be with organic virgin coconut oil and Dawn dish soap… A lot of people like to use olive oil, but I think it’s much harder to get out of the brushes and makes the task take a lot longer! Now let’s all be honest, how many of us actually clean our brushes out after we use them? Not me, that’s for sure! I don’t have time to do it and it’s not the most fun thing to do. Since I don’t do my makeup as often as I’d like, I only need to wash my brushes twice a month. You know how putting organic virgin coconut oil in your hair is really good for you hair? Well, coconut oil contains lauric acid, and that’s been known to reduce candida, it fights bacteria, and awesomely enough it also creates a hostile environment for viruses. Are you starting to get why I use it do clean my brushes? It’s going to be a lot better for your skin if there’s any residue of it left in the bristles. When you use Dawn Ultra Concentrated dish soap, it removes all dirt and, oils and germs! If you’re wondering “Why use an oil if you’re going to be using soap anyway?”. Well simply put, it breaks down any powders stuck inside the bristles of the brushes and breaks down creams and liquids that contain oils. Then after you wash the brushes with soap to remove all of the makeup residue and oils. You always want the brushes at a downward facing angle after they have been washed. Always set them down so the water is being drawn down the length of the bristles and out towards the tips. Never set your brushes upright while they are wet. Doing so weakens the glue, rots the wooden handles and makes it a lot easier for bacteria to breed and mold to grow. Now that all of the details and basics have been mentioned, let’s get into explaining my process! Your makeup brushes and sponges. Last but not least, something to rest them on. I usually use two hand towels, one rolled for height and one laid out. You want to start with a small amount of coconut oil in a microwave safe dish. About a teaspoon worth for twenty or so brushes. Dampen them as you go in warm water, dip the end in a little bit of the oil and swirl the brushes on your hand, between your fingers and really work the oil into the brush. Once you have the oil worked in take your soap and put a drop on your hand and swirl and work the soap in on your hand, massaging the soap in and occasionally squeezing the brush. Repeat that step until the water runs clear. You do this with all of your brushes and sponges until everything is clean. Once you’re done, make sure to gently squeeze out ad much water as possible, then set up your brushes facing down to draw the water out. Let them sit for a few hours or up to a day and you are done! This is by far the easiest way I’ve ever found for washing my brushes! I hope this post helped you and was informative! If you have any questions, let me know in the comments! I need to do this, i cant ever get mind clean ! Yes! It leaves them smelling good too!